You can buy New York Red Bulls tickets online. Ticket prices start at $15, and going to a sports match is definitely something I recommend doing when in New York. Football season runs from March to October. 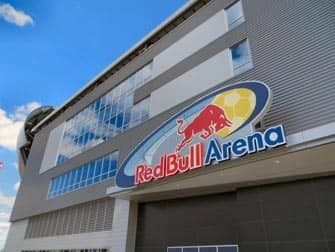 Red Bulls have their own arena in Newark: the Red Bull Arena. You might think football in the US is not so popular, but the supporters are extremely enthusiastic: they sing, cheer and have heated discussions on the stands and the atmosphere in the arena is very nice. If you can’t catch a Red Bulls game, have a look whether the New York City FC are playing. 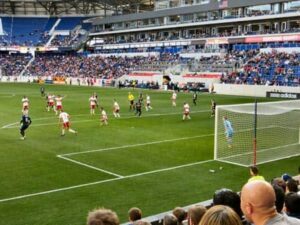 Buy New York Red Bulls tickets now and pay no service fee and get free shipping (e-tickets) or choose free local pick-up! You can buy New York Red Bulls tickets by searching for a date here or check the table below. You can pay for the tickets by credit card and they will be sent to your address or email. If you’d rather pick your tickets up in New York that’s also possible. This option does not cost anything. Also if you’re unable to print out your e-tickets, you can do that at the office. The pick-up point is centrally located, near Times Square. Buying e-tickets is the fastest option and local pick-up is the best option for all other types of tickets. Both options save shipping costs, so I definitely recommend either option. Your tickets are 100% guaranteed authentic and delivered on time. The tickets on the site are from season ticket holders who cannot make it, which is why they are sold at discounted prices. 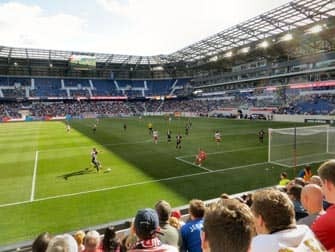 Sometimes the tickets are more expensive than the original price, this means that the Red Bulls game was already sold out. Where Should I sit at a Football Game at Red Bull Arena? You can sit pretty much anywhere in the arena and always have good seats. 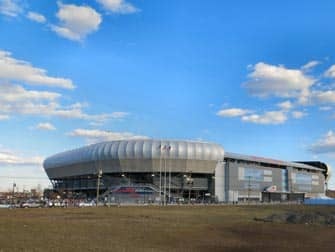 The New York Red Bulls Arena houses around 25,000 people. The cheapest tickets are around $15, these are seats behind the goal. Tickets for seats more in the middle start at $35. The most expensive tickets are those right in the center which start at $75. The photos were taken from section 119 row 7. It is very easy to get to Red Bull Arena with public transport. There is a direct connection from WTC to Newark with the PATH-train. Get off at station Harrison, the trip will take about 20 minutes. You can use your MetroCard and it’ll cost $2.75 per trip. Note that you cannot use the Unlimited MetroCard. From Harrison station it’s about a 6-minute walk to the Red Bull Arena. You can already see the arena from the PATH-train before arriving at the station. Follow the stream of people (often dressed in blue/red), you simply can’t miss the arena. If you’re at the arena a half hour before the match starts then you will have enough time to find your seat and get something to eat and drink. You can of course come much earlier than that, there is enough to see and do! Some families travel with campers and have a barbecue at the parking lot before the match starts. DJ plays music, children play their own football matches and there is a stall where you can buy New York Red Bull caps and t-shirts. Upon entering the arena you will be searched. You can bring a bag and camera with you and even your own bottle of drink (although the cap will be removed). There is enough to eat and drink in the arena: for a small cup of coke, a small pizza and a bucket of popcorn you pay $19. It is very easy to get back to Manhattan with the PATH-train. You could also buy a round-trip ticket or just use your MetroCard again.